A healthy and accurate diet during pregnancy plays the most important role for both the unborn baby and the mother. It is important, since it directly affects the weight of the baby at the time of birth. It also helps to prevent the child from developing diseases such as heart disease and obesity later in life. According to a recent study, women with poor diets before pregnancy are more likely to give birth prematurely than women who have healthy diets. Therefore, it is always recommended to maintain a healthy diet, remain active, and drink lots of fluids. All of this is important for the health of the mother and the unborn baby. Weight gain during pregnancy signifies that your body is nurturing the baby properly. The blood volume increases by approximately 60% when you are ready to give birth. Therefore, during pregnancy, it is essential to include vitamins, minerals, proteins, fats, and carbohydrates as a part of every diet. For a healthy baby, you need approximately 300 calories extra each day (if you have normal body weight). That being said, for individual body requirements, you should consult your doctor. During pregnancy, one should never miss breakfast, as it is the most important meal of the day and helps in keeping the body fit and healthy. Inclusion of food items rich in fiber is also recommended as that helps in preventing constipation during pregnancy. It is a good idea to eat smaller meals at regular intervals throughout your day. You may also eat healthy snacks in order to get the required nutrients. Having a glass of skim milk and a small portion of a sandwich is one such example. Iron is an essential mineral required for the production of blood cells, which prevent you from becoming anemic during pregnancy. It also increases the blood volume if it is consumed with water, sodium, and potassium. Approximately 27 mg of iron intake a day is required during pregnancy. The best sources of iron are whole grains, fish like tuna and salmon, as well as eggs, poultry, lean red meat, vegetables, legumes, dried fruits, and beans. 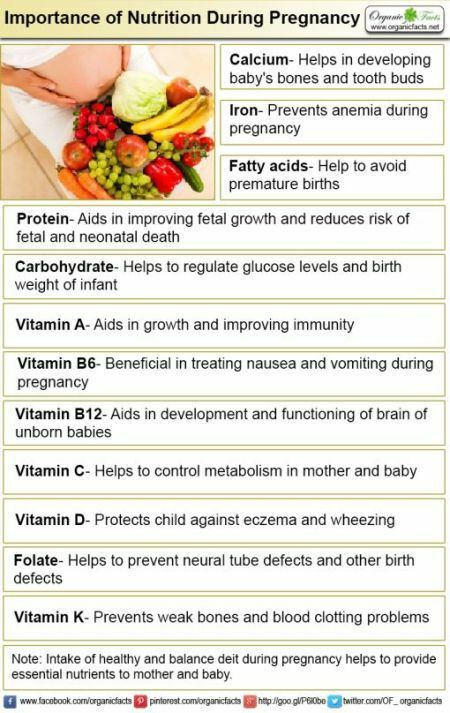 Folate or folic acid helps to prevent neural tube defects (NTD) and other birth defects in the baby. It also helps in the prevention of anemia and low infant birth weight. Before pregnancy and during pregnancy, approximately 0.6 mg to 0.8 mg of folate is required. Some food sources that are rich in folate and folic acid include citrus fruits and juices, legumes, green leafy vegetables, poultry, meat, and Brussels sprouts. Calcium is required for developing the baby’s bones and tooth buds. It also helps to regulate the body’s fluid. Dairy products such as yogurt, cheese, tofu, milk, and eggs are major sources of calcium. Other sources of calcium are cabbage, almonds, white beans, and turnip greens. Vitamin D helps our body to absorb calcium, so it is important to choose supplements that contain vitamin D as well. Approximately 1000 mg of calcium is required every day during pregnancy. Proteins helps in improving fetal growth and may also reduce the risk of fetal and neonatal death. Some foods such as dairy products, fish, meat and poultry, eggs, legumes, tofu, seeds, and nuts are good sources of proteins. Carbohydrates in the diet regulate fetal growth, glucose levels, and the birth weight of the infant. Also, it regulates plasma glucose levels and glycosylated hemoglobin in pregnant women. Carbohydrates are also present in whole grains. Research studies suggests that the quality of carbohydrates consumed during pregnancy is also very important, as it helps in the prevention of metabolic disruptions in the infants and diet-induced adiposity in pregnant women. The body needs more vitamins during pregnancy, especially vitamin A, vitamin B6, vitamin B12, vitamin C, vitamin D and vitamin K.
Vitamin A: Vitamin A is present in mangoes, apricots, yellow sweet melons, sweet potatoes, spinach, liver, fortified milk, and margarine. Vitamin B6: According to a research study, vitamin B6 (also known as Pyridoxine) helps in treating nausea and vomiting (or morning sickness) during pregnancy. This vitamin is found in eggs, meat, liver, beans, cereals, and vegetables. It is safe to take Pyridoxine during pregnancy, but it should only be taken under the guidance of your doctor. High doses are not safe and can cause seizures in the baby. Also, a deficiency of vitamin B6 is bad. The deficiency could develop during pregnancy. Some of the factors leading to the deficiency of vitamin B6 are increasing fetal demand for this vitamin, increasing levels of oestrogens, lower intake of vitamin B6, or the use of oral contraceptive before the conception. Women who are planning for a baby should consume 1.5 to 2 mg of vitamin B6 every day and women who are pregnant should consume 2.5 mg of vitamin B6 every day. Vitamin B12: Vitamin B12 is very important for unborn babies, especially for the development of their brain and its functioning. Low intake of this vitamin by pregnant women may lead to a number of deficiencies in infants such as anemia, poor brain growth, intra-uterine growth and resistance to insulin (especially in children that are 6 years old). Deficiency of vitamin B12 at the start of pregnancy may lead to Neural Tube Defects (NTD) in the infant or even premature delivery. Vitamin C: Vitamin C helps to keep the overall metabolism in correct order. Vitamin C is required by the mother as well as the baby and cannot be stored in the body. Therefore, eat lots of fruits and vegetables. Also, vitamin C helps in the development of bones, teeth, and helps in healing wounds. Approximately 85 mg of vitamin C is required every day. It is present in fruits and vegetables. Cabbage, pepper, and potatoes are good sources of vitamin C. Fruits rich in vitamin C are kiwis, oranges, strawberries, melons, grapes, tomatoes, lemons, and mangoes. Bean sprouts are also a good source of vitamin C. You can sprout mung beans, black eyed beans, fenugreek, alfalfa, haricot, and green lentils for the same effect. Vitamin D: Research studies suggest that a higher intake of vitamin D during pregnancy protects the child against eczema and wheezing. Vitamin D not only helps in the development of bones but also helps in the prevention of diseases. Vitamin D is made in the skin through exposure to ultraviolet-B light. Therefore, vitamin D is not present in the food we eat. Vitamin D can also be taken in the form of vitamin D supplements or vitamin D-fortified milk. Deficiency of this vitamin or milk restriction in pregnant women may lead to smaller babies (that is babies with lower birth weight). Lack of vitamin D in pregnant women may lead to rickets, type 1 diabetes, and schizophrenia in children. Vitamin D is present in eggs, liver, oily fish, breakfast cereals, powdered milk, and margarine. Pregnant women should avoid raw or uncooked eggs and liver products. Also, fish intake should be restricted to a few varieties, such as tuna. Pregnant women should start taking vitamin D from 12 to 16 weeks and should consume approximately 4000 IU per day. Vitamin K: Sources of vitamin K are lettuce, cabbage, broccoli, dark leafy vegetables, liver, eggs, and other dairy products. Vitamin K is good for preventing weak bones and blood clotting problems. However, higher amounts without the guidance of your healthcare professional should be avoided during pregnancy. Omega-3 fatty acids are good for the overall development of the baby’s nervous system. Omega-3 fatty acids can help avoid premature births. These fatty acids are particularly found in the brain. Therefore, pregnant woman requires two to three portions of fish per week. Fish that are high in Omega-3 fatty acids are salmon, mackerel, herring, snoek, butterfish, anchovies, pilchards, and anchovies. During pregnancy, various foods should be included in the diet for optimal maternal health and the reduced risk of birth defects. Whole Grains: They are good source of energy and provide carbohydrates and fibers, which help to prevent constipation, a common problem during pregnancy. Eat lots of bread and cereals, including rice, pasta, and other grains during pregnancy. Other varieties include spaghetti, oatmeal, macaroni, cornmeal, and buckwheat. Pregnant women should eat up to nine servings or portions every day. One serving or portion includes: Cooked pasta (spaghetti or macaroni, etc.) – ½ cup, cooked cereal (Rice, oatmeal or buckwheat) – ½ cup, one large slice of bread (30 to 40 g), and one cup of ready-to-eat cereals. Food in this group contains important nutrients such as iron, zinc, calcium, and various vitamins. Green Leafy Vegetables: Green leafy vegetables contain many protective components that help to keep us healthy, especially during pregnancy. It is said that no tablets of vitamins and minerals can replace vegetables that you eat. Therefore, pregnant woman should consume up to four servings of these vegetables each day. One serving means approximately one cup of green leafy vegetables (cabbage, turnip, lettuce, collard, spinach, broccoli, etc. ), half a cup of other vegetables – raw or cooked, or fruit juice – ¾ cup. It is advised to cook vegetables in a minimal amount of water, boiling for approximately five to ten minutes. As vitamin C might get lost during the preparation, it is better to steam, microwave, bake the vegetable instead of boiling it. Try to eat fresh (raw) or lightly cooked vegetables. Meat: During pregnancy you can consume approximately two servings of meat varieties such as beef, poultry, and seafood every day. One serving comprises approximately two to three ounces. One serving, approximately three ounces, of salmon can also be consumed, as it is rich in calcium, as well as one serving of eggs (one large egg), or 2 tablespoons of peanut butter. Other varieties include seafood, fish which is properly cooked, chicken, pork, lamb, lean beef, and liver. Nuts that are rich in calcium and proteins, especially almonds, should be consumed during pregnancy. One serving of nuts is approximately one third of a cup. Fruits: Fruits are rich sources of vitamins and minerals. Therefore, pregnant woman should consume two to three servings of fruits daily. One serving is approximately half a cup chopped fruits, one medium-sized banana or apple, or fruit juice – ¾ cup. Citrus fruit varieties such as grapes, guava, strawberries, oranges, kiwis, tomatoes, melons, mangoes, lemons, potatoes, and peppers should also be consumed during pregnancy. Legumes: Two servings of legumes should be consumed every day. One serving is approximately half a cup. Black beans, kidney beans (red and white), navy beans, chick peas, split peas, and black-eyed peas are some of the examples that can form part of your daily diet. White beans are quite rich in calcium. Dairy: Pregnant women can consume between two to three servings of dairy products every day. One serving of milk (approximately one cup), one serving of yogurt (approx. one cup), one serving of tofu (approx. half a cup), or one serving of pasteurized cheese (approx. 1.5 ounces). Fluids: During pregnancy, it is recommended to intake approximately 2.4 litres of fluids daily, which roughly equals 10 glasses of 250ml. Pregnant woman usually gains the weight between 10 to 15 kilograms during pregnancy. Those who do not gain enough weight may face some complications like lung and heart problems and even premature birth. Some discomforts are common during pregnancy, such as heartburn, nausea, or constipation. However, if you choose to eat healthy food regularly, drink lots of water, cut down on excess sugar and fat, and exercise, you may reduce those discomforts. You can walk or swim during pregnancy, but consult your doctor before you start. Avoid consuming alcohol, smoking, and using drugs. Avoid the caffeine that is present in soda or coffee. If you eat meat, make sure that it is properly cooked, as it might contain harmful bacteria such as salmonella. Also, there are some fish varieties that contain high levels of mercury. It can harm the nervous system of the unborn baby, so always check before you eat. Average rating 4.4 out of 5.0 based on 32 user(s).